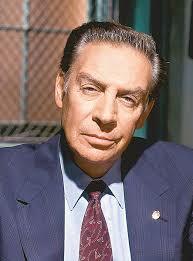 In a statement, the producers of Law & Order: Trial By Jury announced production on the show will continue despite Tuesday's death of star Jerry Orbach. The show had shot three episodes with Orbach, which will eventually air. The statement also noted that "While Jerry is irreplaceable, Law & Order: Trial by Jury is an ensemble and will continue." Meaning, essentially, that he is replaceable, and will in fact be replaced. Gotta love that flack jive!